The life of a saint is like a great poem, endlessly fascinating, elusive of our complete grasp, rich with wisdom that knows no expiration. The life of St. Ignatius of Loyola has that poetic quality in abundance. Today, we speak of Ignatian spirituality, Ignatian pedagogy, Ignatian prayer, Ignatian indifference and, increasingly often, Ignatian education. The range of his influence is extraordinary, and it testifies to the brilliance, originality and faith of one of the pivotal figures of the Western and Catholic traditions. The word "education" is likewise expansive -- like art, open to various interpretations and understandings, some of which conflict and confound. On the one hand, it seems so simple -- a good book, a wise teacher, and a rich discussion. On the other hand, the field of education can strike us as impossibly complex, as a tangle of regulations and standards and debates about "closing the gap" and raising test scores. Given the broad nature of education, this blog will cover a variety of topics, but always with an eye toward the Ignatian story or perspective. Among the questions it will span: What does it mean to educate within and for the Catholic faith? What does it mean to educate for formation and conversion? How should education integrate spiritual and academic excellence? Perhaps most pressing of all, what is education, and who is rightly called an educator? "The Classroom After the Cannonball"
Most readers probably know the story, but it might be helpful to explain the subtitle of this blog. In 1521, Ignatius, then thirty years old, was defending Spain against a French incursion at Pamplona. In the battle, a cannonball badly wounded Ignatius’s right leg, leaving him to months of painful convalescence. While his leg healed, Ignatius could do little else but think and read. He ended up in the company of two books, one about Christ and one about the saints, and as he read, he began to imagine dedicating himself to poverty and service in imitation of people like St. Francis and St. Dominic. He also began to sketch notes on the discernment of spirits, on the movements of consolation and desolation that would later become a focal point of his spirituality. The cannonball injured his leg, but it did something else that had a far greater effect. It shattered his previous life -- his plans to be a courtier and win worldly glory. The cannonball was the catalyst for what I hope my students experience (and without a cannonball): it set Ignatius on the path to freedom, on the path of his own exodus that left him with nothing but the desire to follow God. This blog, therefore, will explore education through that post-cannonball lens, through the motifs of metanoia, pilgrimage, discernment, and much more. At the same time, it recognizes that there was life before the cannonball; there was the soldier before the saint. So the writing moves across that fault line, recognizing the pull of the past as well as the invitation to conversion, which St. Ignatius accepted most remarkably. Hi Beth, thanks for writing. I hope you find the blog worth your time. 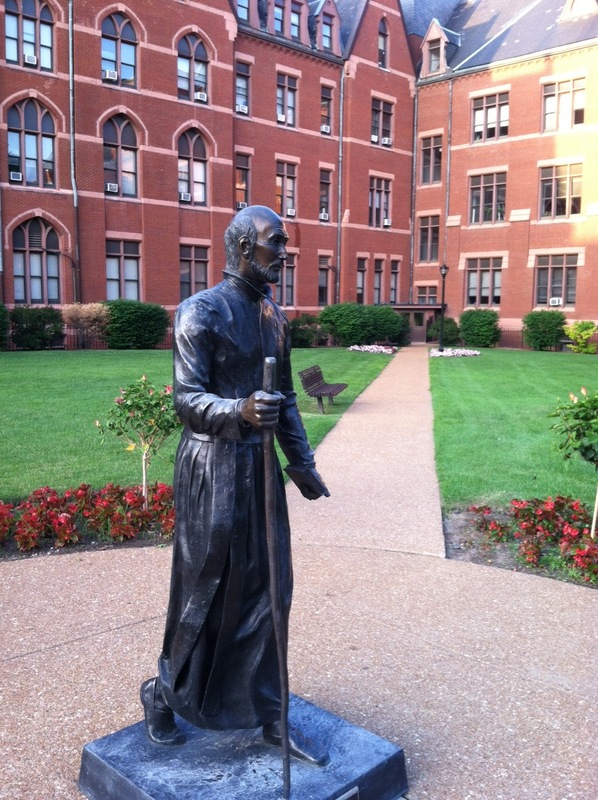 Yes, the photo is from SLU, my alma mater! This is a wonderful undertaking, to share Ignatian Spirituality. Thankyou.